Think about the foods that you love eating. One taste of your favorite food and your body goes into a state of euphoria. Now think about all the people who deal with missing teeth every day that can’t enjoy the foods that you do. It’s a real shame, isn’t it? Missing teeth can cause problems that nobody wants to deal with. Not being able to eat their favorite food is one of them, not to mention the possibility of diseases forming from the open spaces in the mouth. If you are presently dealing with missing teeth we want you to know that there are ways to close the spaces for good and start enjoying life with a beautiful smile once again. Our office in Weatherford, TX houses one of the best dentist teams in the area: Dr. Romack and Dr. Mulkey. Together, they form a team that can bring excellent dental health back to your mouth in just a few short visits. You may have heard of dental implants and all of the benefits that they can offer people who suffer with missing teeth, but are you aware of what they actually are? They double as artificial tooth roots to support the area where missing teeth are located. They maintain the smile’s structure while also reinforcing the strength and stability your jaw bone needs. 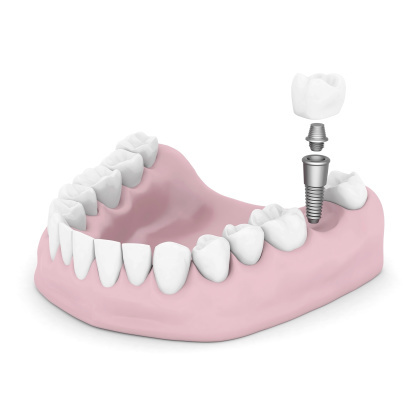 With dental implants, you no longer have to worry about painful chewing or other tasks that require using your teeth. Just think, you’ll be able to bite down without any pain. It isn’t just relieving the pain that dental implants can do for a person. They also bring improved stability and appearance to your smile. You don’t have to worry about hiding your smile anymore. People will stop in their tracks to get a look at that beautiful grin of yours, all it takes is getting dental implants to get the look you want. It’s a question that we’re asked over and over. The answers may surprise you. There are many reasons why teeth go missing. But, they don’t have to be gone forever. Look into dental implant therapy so you can start living a life free of pain and embarrassment. If you’re in need of dental implant service in Weatherford, TX, we’d be glad to help you out. If you live near the area and want to visit our office, don’t wait a second longer! We gladly accept patients from Greenwood, Annetta, Brock, Peaster, Aledo and other areas. by: tntadmin at August 11, 2015 .